Math is constantly happening at our house. And right now, tally marks, as well as skip counting by obscure numbers, have been hugely popular. Decimals too, but I have yet to find a suitable activity for my math-loving five year old to cover that topic! Anyway, the simple tally marks elementary math tray that I assembled was a hit and spurred more tally marks love in our house. 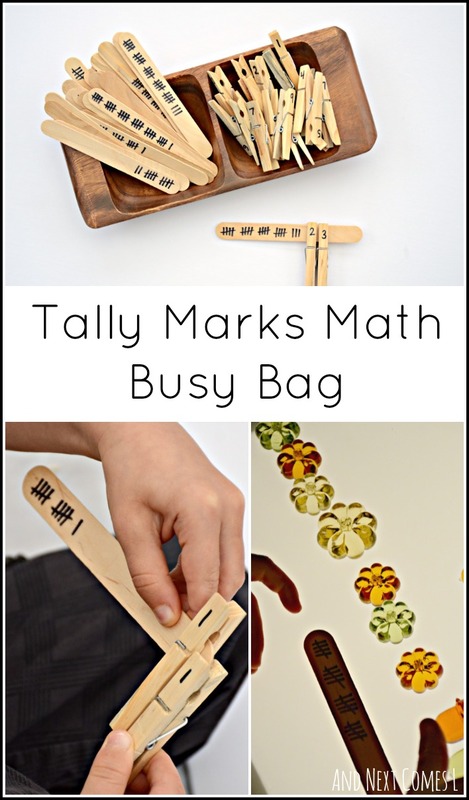 So I came up with this simple math busy bag idea to further explore tally marks. We ended up using it in a variety of ways. I wrote individual numbers on the clothespins (0-9). I made two of each for most of the numbers. I did not do two eights or two nines because I wasn't about to draw up to 99 tallies on one craft stick. That would be crazy. And I'm not that crazy. As for the craft sticks, I drew tally marks for the numbers 10-35. Or in other words, I drew enough tallies to make me cross-eyed and to deplete my supply of craft sticks. One way to play with these tally mark sticks is to organize them in numerical order, like below. J loved doing this both vertically and horizontally. He also organized them by skip counting by fives (10, 15, 20, 25, 30, 35) and by tens (10, 20, 30). Another way to play with the tally marks sticks is to count the tallies and clip on the corresponding number using the clothespins. We also played a number scavenger hunt. I'd simply call out a number and then J would hunt for the matching craft stick. Finally, J asked to put them on the light table. J would pick a tally mark craft stick and then count out the corresponding number of items. He used acrylic pumpkins and acorns from the dollar store. It is fall after all! I love everything about this, Dyan! We've been doing a bit with tally charts lately. I've also been gathering ideas for busy bags. This is perfect! Thanks, Ann! It's so simple isn't it?